Taking a walk? Why not sit down and read a book afterwards? 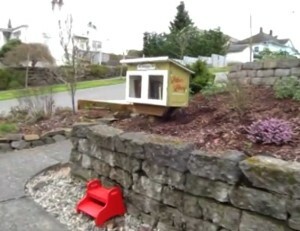 Tiny, front-yard libraries are popping up in neighborhoods around Seattle and across the country. Many builders of these birdhouse-sized units are inspired by the Little Free Library movement launched by a carpenter and a community educator in Madison, Wisconsin. The boxes–some basic, some quite elaborate–invite passers by to stop, browse, chat, and to borrow (or leave) a good read or two. Hillman City and Columbia City are becoming a little epicenter for these libraries in the Seattle area, as shown by Howard Gutknecht’s video tour above. Interested in creating your own little free library? Check out these photos for further inspiration!